There is no one inside Suitsat-1 as it floats away from the International Space Station above Earth on February 3, 2006. Suitsat is a worn out Russian Orlan space suit of a type used by Russian, American and European astronauts. Suitsat was released by the ISS Expedition 12 crewmembers during a spacewalk. The odd satellite was outfitted by the crew with three batteries, internal sensors and a radio transmitter, which faintly transmitted recorded voices of school children to amateur radio operators worldwide. Click the image for a broader view. What do you do with a worn-out spacesuit if you're a couple of hundred miles above Earth aboard the International Space Station? If you were the Expedition 12 crew, you would stuff it with some science instruments and a radio transmitter, and toss the old suit overboard. It would float around the outside of the station for a while then gradually descend into the thicker atmosphere below where it would burn up. Along the way, students on the ground around the world would learn a lot about space and science. Science fiction? Satsuit was real and was launched by hand from the orbiting International Space Station on February 3, 2006. The free-floating space suit became an unmanned satellite transmitting pre-recorded voices. Russian Orlan spacesuits have a finite lifetime after which they no longer can be worn. In the past, unwanted objects aboard the ISS, including old spacesuits, have been sent down into the atmosphere to burn as trash. This time, however, ISS Expedition 12 commander Bill McArthur and flight engineer Valery Tokarev sent the old spacesuit on one final mission. During a spacewalk outside the station, the crew shoved the empty suit off into space. They called it Suitsat-1. It was known in Russia as Radioskaf or Radiosputnik. Down below, on the surface of Earth, amateur radio operators and listeners with police scanners and other radio equipment listened for the Suitsat transmissions and voices. Flight success. The satellite transmitted data as it orbited Earth. Listeners on the ground heard its radio signals for slightly more than two weeks, until February 18, 2006. Suitsat-1 was sponsored by Amateur Radio on the International Space Station (ARISS), an organization of volunteers from national amateur radio societies around the world, and the Radio Amateur Satellite Corporation (AMSAT). Suitsat signals were weak, according to AMSAT, but still were heard on the ground on the satellite's 145.990 MHz FM frequency. Speculation about the weak signal centered on low battery power, weak transmitter output or bad antenna connection. Hearing such low-power signals on the ground required sensitive VHF receiving equipment and high-gain antennas. AMSAT confirmed the spacesuit's electronic system had been turned on successfully by the ISS crew prior to deploying it; the timing, micro-controller and audio operated properly; and the last reception on the ground was on February 18. Designated AMSAT OSCAR 54 (AO-54), SuitSat-1 was heard by ham radio operators and school students around the world. Frank H. Bauer, KA3HDO, AMSAT vice president for human spaceflight programs and ARISS international chairman, reported that an unknown object had become detached from Suitsat and had become a separate satellite. The object may have been one of the spacesuit gloves or the School Spacewalk compact disc (CD) which had been attached to the outside of the spacesuit. NASA TV image of spacewalking astronauts releasing Suitsat (right center). Not exactly empty. Although no person was inside the suit, it had a radio transmitter, temperature sensors and materials created by students around the world, including voice recordings and artwork. The suit broadcast on the amateur radio – a.k.a. ham radio – frequency of 145.990 MHz. That's above the frequencies of 88-108 MHz where FM radio stations broadcast and is in the amateur radio VHF 2-meter band. Suitsat used narrow-band FM (NBFM) modulation to carry its messages. The radio box inside the spacesuit housed the Kenwood TH-K2 ham transceiver. Another box inside the suit held a micro-controller and electronics that stored and played back the digital voice and video recordings. Also inside the suit were the batteries that powered the system. On the outside of the suit was the radio antenna, a crew interface control box that turned on power to Suitsat, and the students' School Spacewalk compact disc (CD). Suitsat's transmissions were received easily by anyone with simple, inexpensive equipment such as a police-band scanner, VHF FM receiver, or a ham radio VHF handie-talkie. Best reception came when the receiving antenna was outside and clear of objects blocking signals from the sky. Higher locations had better reception. A good high and clear place allowed a listener to hear it longer each time Suitsat passed overhead. Suitsat is a specially-equipped Russian Orlan space suit like this one. A control panel for activation by the ISS crew is attached to the top of the helmet. Orlan spacesuits have been used by Russian, American and European astronauts. Students around the world contributed materials for the Suitsat audio Compact Disc (CD). Flight engineer Valery Tokarev in this NASA photo puts the finishing touches on the old Russian Orlan spacesuit before launch. The white box with switches, attached to the helmet, is Suitsat's power control panel for use by Tokarev outside the space station. Educational medium. Students, scouts, teachers, ham radio operators and the general public were encouraged to tune into the signal as long as Suitsat remained in space. An overhead pass lasted about 10 minutes. Transmissions included student recordings, information about the condition of the spacesuit as it floated through space, and a special commemorative picture. Suitsat-1 carried a collage of student drawings on the students' School Spacewalk compact disc (CD), which contained over 300 items submitted by schools, including several NASA Explorer Schools, and other educational organizations around the world. The disc held such things as creative artwork, student signatures, class and group pictures, and school or scout troop logos. The U.S. message was from a student at the Eastern Middle School, Silver Spring, Maryland, a NASA Explorer School. The Suitsat-1 identification announcement was spoken by a Korean-born girl enrolled at Paint Branch High School at Burtonsville, Maryland. Suitsat science. The content of the continuous radio transmission was repeated on an 8-minute cycle. Announcements were heard as Suitsat flew overhead. the mission elapsed time in minutes. the inside temperature in degrees Celsius. The formula to convert Celsius to Fahrenheit is Fahrenheit = (9/5)xCelsius+32. the battery voltage telemetry where 28 volts was nominal. pre-recorded greetings in multiple languages. a station identification, "This is Suitsat-1 RSØRS." a single, cell phone quality, slow-scan television (SSTV) picture was transmitted. It took 36 seconds to transmit the image. The NBFM signal on 145.990 MHz had a transmitter power of 0.5 watts to a low-gain omnidirectional antenna. A ham radio cross-band repeater aboard the space station could retransmit the signals from Suitsat on a frequency of 437.80 MHz. The repeater transmits 10 watts of power, which might be received more easily on Earth. Reception rewards. Anyone who received the voice signals or captured the commemorative picture beamed down by Suitsat-1 was eligible to receive a certificate from ARISS. In addition, Suitsat's transmissions included special words pre-recorded by the satellite's student "crew members" around the world. Students who found the special words as they are transmitted by Suitsat were eligible to receive an additional education award. Because the special words were in different languages – English, French, German, Japanese, Russian, Spanish – students were encouraged to work with others who spoke those languages. If you heard SuitSat, you became eligible to receive a special certificate in commemoration of your achievement. If you received the SSTV image, copy the telemetry or copy the special words, special certificate endorsements were available. To receive a SuitSat special certificate, please use the standard QSL card address in your area of the world, which can be found at www.rac.ca/ariss/oindex.htm#QSL's. Message sequences. To save battery power to maximize the time that Suitsat was operational, 30 second pauses were included between each of the voice messages. How long could it last? 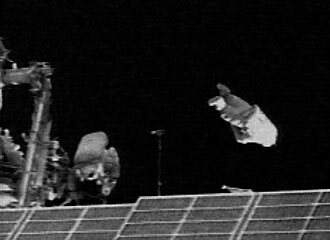 The ISS crew pushed Suitsat-1 away from the space station into a trajectory that caused it to fall slowly from orbit and re-enter Earth's atmosphere where it would burn up. The satellite had no external thrusters to adjust its orbit. It might last several weeks before it would fall low enough to burn up. How long it transmited depends on battery life and how long it took the suit to get low enough where it would be too hot to transmit. The batteries had no charger so they had a relatively short lifetime. The radio signal disappeared February 18, weeks before the suit burned up in the atmosphere. A second Orlan spacesuit is expected to be available for use as Suitsat-2 in 2007. Bauman Moscow State Technical University. Suitsat-1 was sponsored by Amateur Radio on the International Space Station (ARISS), an organization of volunteers from national amateur radio societies around the world and the Radio Amateur Satellite Corporation (AMSAT). Russian participation in the project commemorated the 175th anniversary of the Bauman Moscow State Technical University where many of the engineers in the Russian Space Agency were graduated. The Russian-language messages transmitted by Suitsat included congratulations to the university. This ARISS international team was able to fabricate, test and deliver a safe ham radio system to the ISS team just three weeks after the international space agencies agreed to the Suitsat experiment. The spacesuit satellite was deployed successfully from the ISS, demonstrating to professional space agencies that this can be safely done. The student's creative artwork, signatures and voices were carried aboard the spacesuit. CD pictures of of the late Roy Neal, K6DUE, and the late Thomas Kieselbach, DL2MDE, radio amaturs who contributed to the ARISS program, were aboard Suitsat-1. Suitsat focused media attention on the project and on amateur radio. Suitsat captured the imagination of students and the general public worldwide through its unique experiment.